William Francis Duggan was born on September 25th, 1895 in Burlington, Chittenden County, VT. The son of William Amos and Katherine M. Duggan, he married Georgianna Esther Hall of 19 Cherry Street, Burlington on June 6th, 1916. With William’s WWI service record researched, I began to look into his pre and postwar life in Burlington. He lived in the my community, and such, I’m interested in his comings and goings on the streets that I frequent. It turns out that Will likely knew the streets of Burlington better than most 2016 residents! During his lifetime, William F. Duggan worked as a streetcar operator, fireman,used furniture salesman, taxi driver (many years), and as a Burlington Electric employee. Quite the credentials! 1954 Burlington Directory – Note occupation as taxi driver at the corner of Main and St. Paul St.
1962 Burlington Directory – Finally retired! Woo Hoo! Although I can’t find the marriage record for his second marriage, I do know that he remarried later in life and had six children with his second wife. William and Mary Louis Rielling had six children together – Patricia, Dorothy (Quintin), Mary (Kidder), Elizabeth (Rousseau), Kathleen (Dutra), and Robert Duggan. As of the writing of this post, only Patricia has passed. William sounds like an incredible guy, and I hope to learn more about him and his exploits through this post. A wartime photo of him would be the icing on the cake! Although Portraitsofwar of tends to deal with the United States during WWI, this video seemed like an interesting contrast and comparison between the European forces during WWI. WWI University of Vermont 1917 Alumni Navy Veteran – LOST AT SEA – Carroll Goddard Page UPDATE! 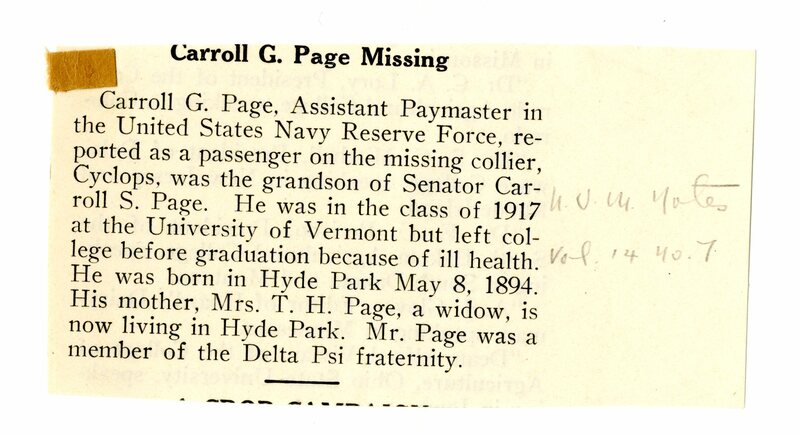 PortraitsofWar researched the collegiate times of Carroll Goddard Page back in August of 2011 in hopes of raising interest in the strange loss of the USS Cyclops; the presumed death of this UVM alumni during WWI was also a major focus of our research. 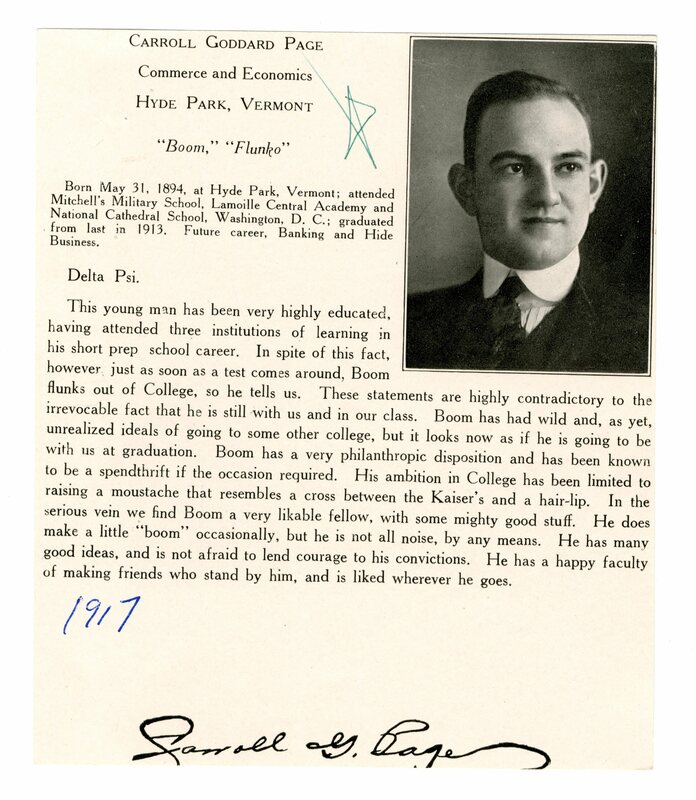 Since then, we’ve looked into various aspects of the University of Vermont during WWI with highlights including panoramic photos taken during the war years as well as photographs of local boys who served in France and Germany in 1917-1921 respectively. After seeing a recent eBay auction pass during a common search routine, PortraitsofWar’s author instantly recognized the sitter as Carroll Goddard Page. What are the chances? At a reasonable $11.73, we made the purchase in hopes of donating the image to the University of Vermont’s Special Collections unit located in the library. The 2011 post below was created with scant information based on a visit to the UVM Library Annex (when it was still open to researchers) in hopes of tracking down students who served with distinction in WWI. Our main focus that day was to research soldiers/sailors/marines/nurses who were wounded in action (WIA) or killed in action (KIA) during their period of service. Interest was also paid to servicemen/women who died of disease or complications during their time in service. One of the biggest mysteries of the US NAVY during WWI is the inexplicable loss of the USS Cyclops (AC-4) while transporting 300+ passengers/crew and a load of manganese ore from Brazil to Baltimore in 1918. 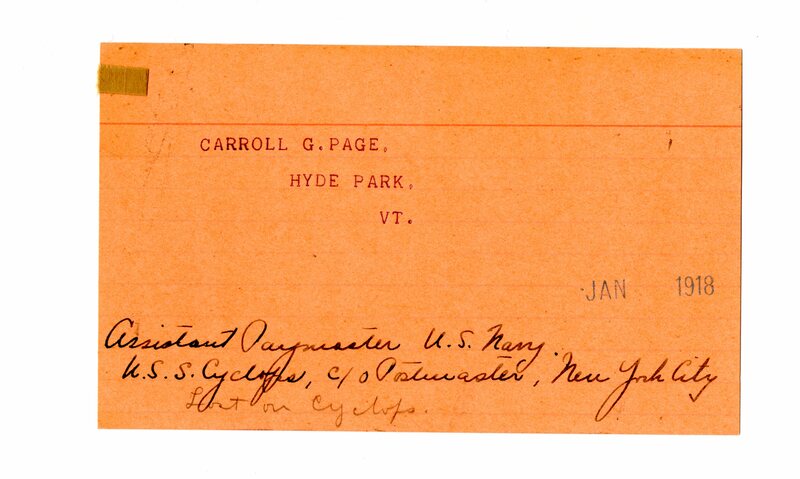 Carroll Goddard Page, UVM Class of 1917, was aboard as paymaster when the ship disappeared without a trace on March 4th, 1918. Although a structural failure in the engine is likely the cause, we may never know the true reasons behind the disappearance. A recent eBay purchase has been incredibly fun to research and has yielded some solid and fulfilling results. I purchased a group photo of four US soldiers posing in an American studio immediately following the war. How do we know they are in an American studio? 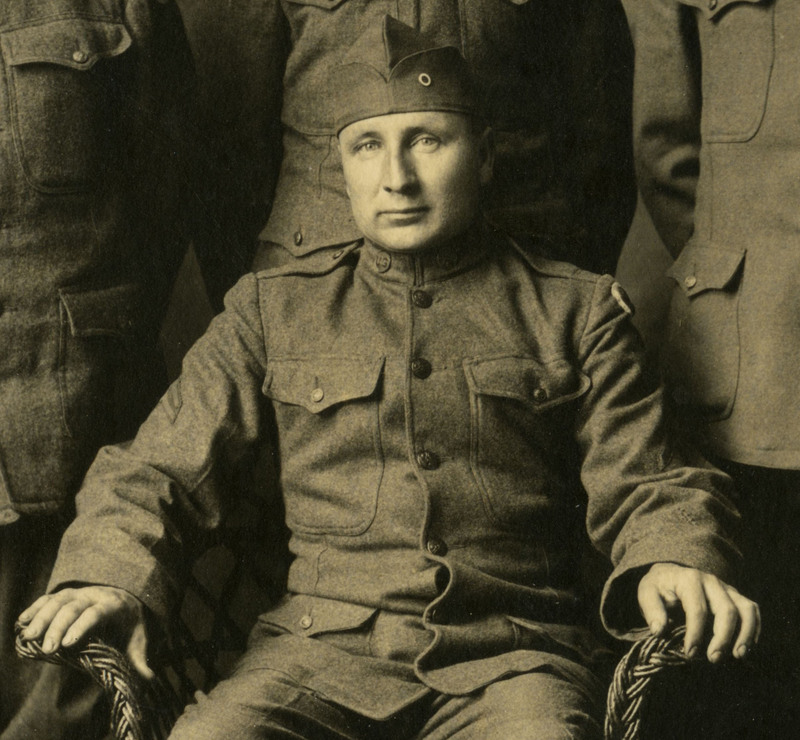 The veteran at center is wearing a WWI Discharge Chevron, also known as a Discharge Stripe or Honorable Discharge Stripe, which indicates that the soldier has been discharged from his service and can wear his uniform in public with the proviso that he affixes the chevron. Apparently, it was possible to be arrested for wearing a service uniform without the stripe after three months following discharge. Each discharged soldier was issued with three discharge chevrons. Officers had to purchase their own. Upon being discharged from service, the uniform could be worn for a maximum of three months without the red discharge chevron. If the uniform was worn after the three month period had expired, the person wearing it could be charged with the offense of impersonating a soldier. If the uniform was never worn again the discharge chevron did not have to be sewn on. As soon as a soldier received his discharge papers he became a civilian, and he was no longer obligated to salute a superior officer. If it is your desire to go home in uniform, it is your privilege to do so, under full grant of an act of Congress. You may wear your issue uniform as long as it hangs together if you wish. It is yours. But do not let a minute pass, after being discharged, until you have sewn on, or had sewn on a red chevron, point up, midway between the elbow and the shoulder on the left sleeve. The wearing of any gold, silver, or metal device indicating service is forbidden. Only regulation service chevrons and collar insignia are authorized by law and regulations. Wound and service chevrons for service in any of the Allied Armies are included in that authorization. Can all camouflage. Ok – so we know the photo was taken stateside at some point after the war, but recent enough to warrant a group shot of all four men in uniform. The photo trifold mount had “Ward Boys” scribbed on it with no additional identifying information. The seller was from Ohio, so I started with a basic search for Ohio veterans with the last name of Ward. Big mistake……. 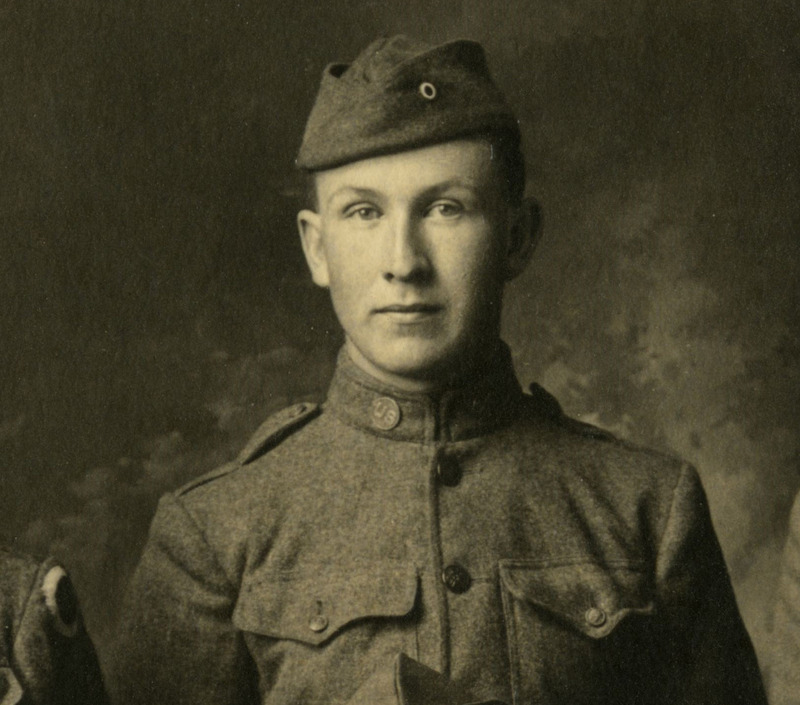 There were nearly a hundred men with the last name of Ward who served in Ohio during the war. Take a deep breath….. 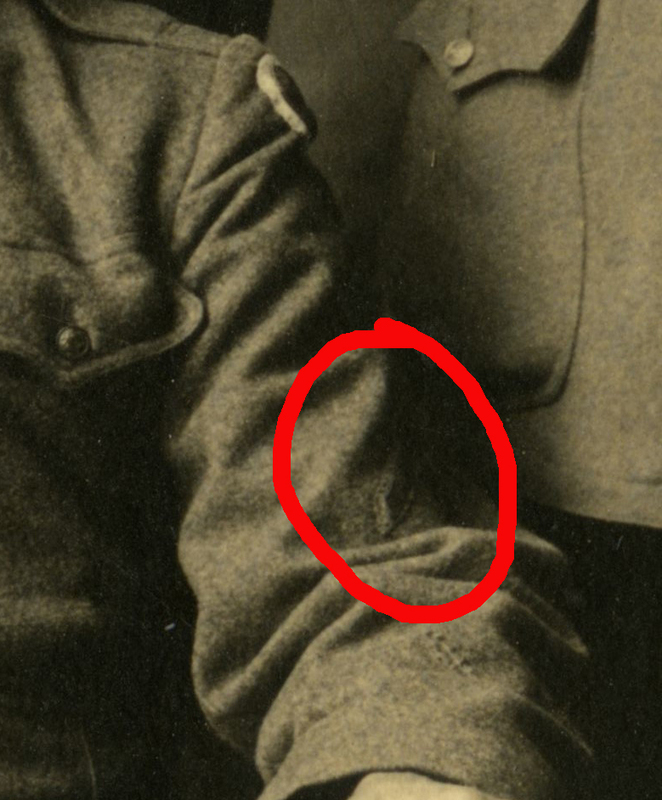 I needed to narrow down the search and the image itself provides a very good way in which to identify one of the soldiers based on his patches. Bingo! 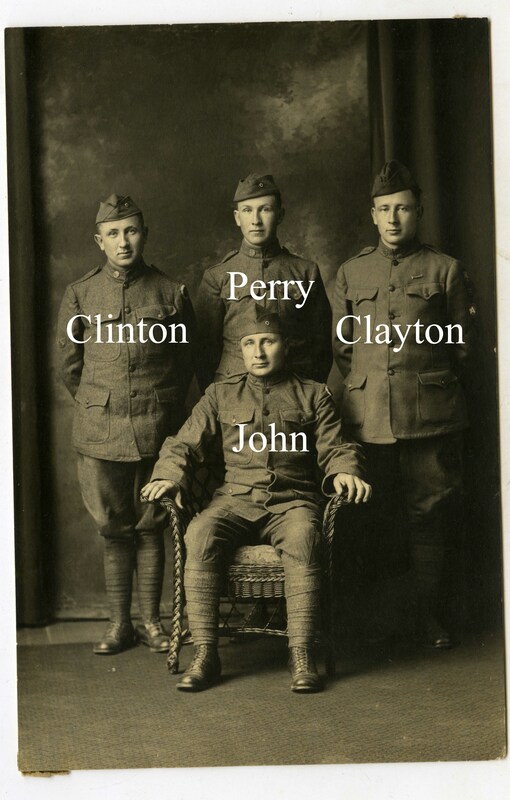 After interpreting the abbreviated information in the Ohio WWI book, I was able to determine that Clayton was born in Defiance, Ohio, was 24 years of age, and served with Company H of the 332nd Infantry Regiment. With the place of birth info, I was able to identify all the additional men in the photo using clues present on each of their uniforms. Based on the information provided in the reference book, Clinton Ward, age 26 1/12 at the time, enlisted with Company G of the 6th Infantry of the Ohio National Guard. 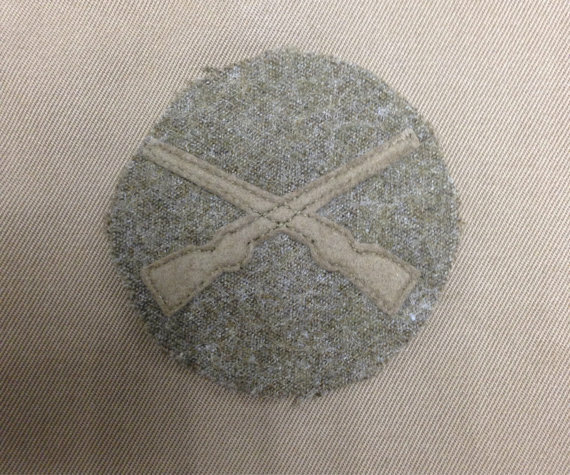 This unit was federalized and became Company G of the 147th Infantry Regiment. 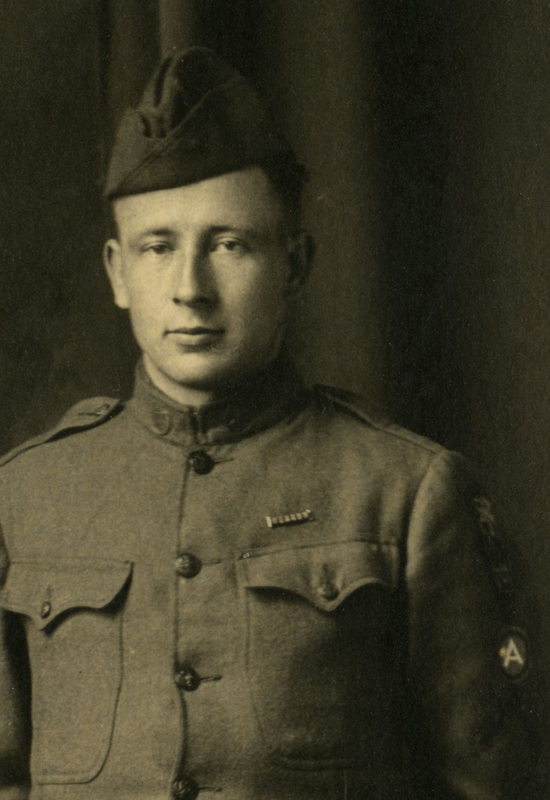 He rose to the rank of Private First Class on May 15th, 1918. Since I’ve memorized the rank insignia of the AEF, I was able to quick pick him out. Since he’s the only one wearing a Pvt. 1st Class patch in the photo, plus the addition of infantry regiment collar discs, he’s almost certainly Clinton. Although it’s tough to make out in the scan, the soldier is clearly wearing a collar disc that depicts a set of crossed cannon. 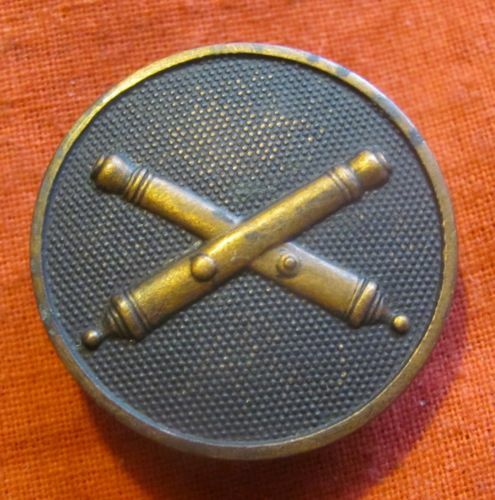 This would indicate service in an artillery unit during the war. Perry’s reference in the aforementioned Ohio WWI book shows that he served with the 52nd Coastal Artillery Company during WWI, which would be supplied with these exact collar discs. At this point, I’ve been able to identify three of the four soldiers in the photo based on archival research, visual interpretation and identification of key pieces of military insignia, and a gut feeling. The last soldier, shown sitting turned out to be a tough nut to crack. Ok – so what do we see in the photo? 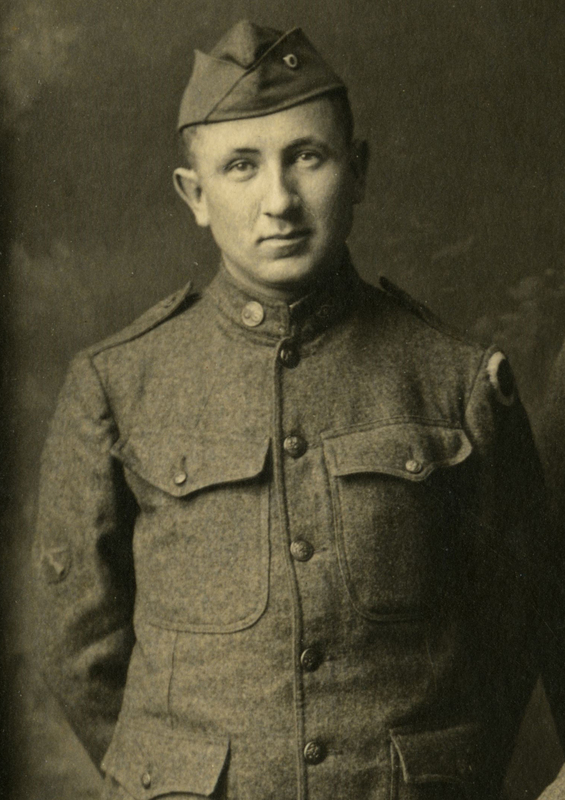 John Alvin Ward was a brother who separated from the family early in life (no idea why) and eventually rose to the rank of corporal in WWI as part of the 147th Infantry Regiment. 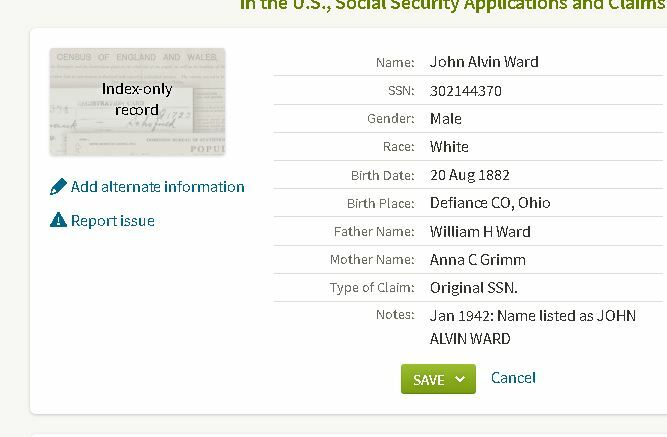 It was tough to parse out the details regarding his upbringing, but the following Social Security information confirms that he was indeed from the Ward family of Defiance, Ohio. At first I was confused about the portion mentioning his father being identified as a William H. Ward, but upon further genealogical research it became clear that his father commonly switched his first and middle names; this is a common practice that becomes terribly difficult for researchers. So, we have the older brother who left the family and posed with his brothers after returning home from war in 1919. Sadly, the photograph was discarded at some point and made it’s way into the eBay chain; eventually ending up on the desk of an intrepid WWI researcher (Me!) who was able to bring some context to the photo using easily-accessible internet resources. I hope I’ve inspired some readers to delve into their own collections of photos in hopes of giving a name to the faces sitting in photo binders and dusty drawers. The Official Roster of Ohio Soldiers, Sailors, and Marines in the World War, 1917-18. Columbus, OH, USA: The F.J. Heer Printing Co., 1926.